Theo Fabergé loved the Orchid, above all other flowers. Inspired by its eternal beauty and furthering his famous grandfather Carl Fabergé's love of flower surprises, Theo's PINK ORCHID EGG allows nature and craftsmanship to combine in an eloquent testimonial to his art. The creation incorporates the materials and skills made famous by the Fabergé's at the Imperial Court of St Petersburg at the turn of the last century. 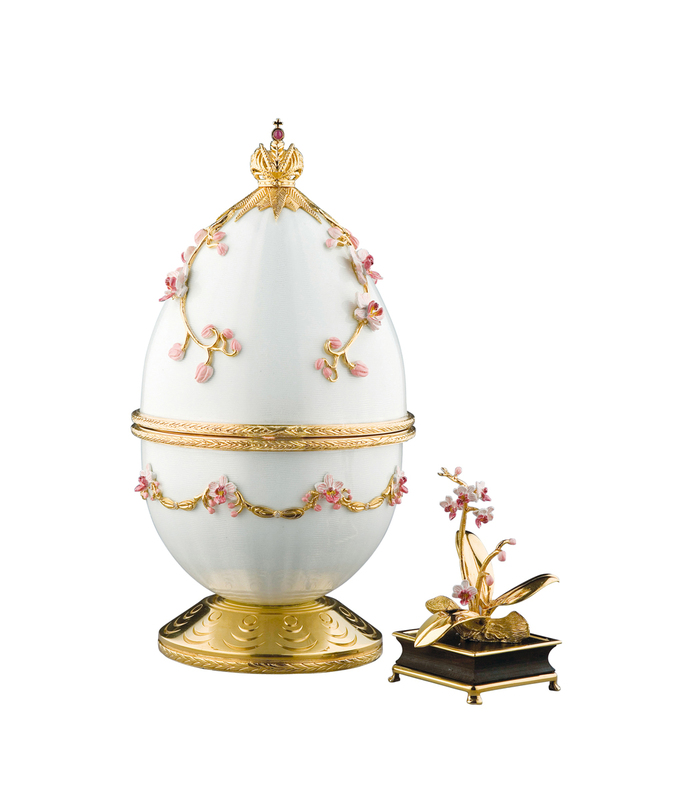 The PINK ORCHID EGG is engine-turned and guilloché enamelled in pristine white. Sterling silver orchid sprays, decorated with 24-carat gold and hand-enamelled in pink, adorn the upper sides of the Egg. The lower half is offset with further sprays of enamel, gold and silver, with the famous Fabergé swags formed in stylised orchid leaves and bearing eight full-cut diamonds - one for each of Theo's eight decades. The finial, set with a cabochon ruby, represents the Romanov State Crown. The base is ornamentally turned on Theo Fabergé's own Holzapffel lathe. 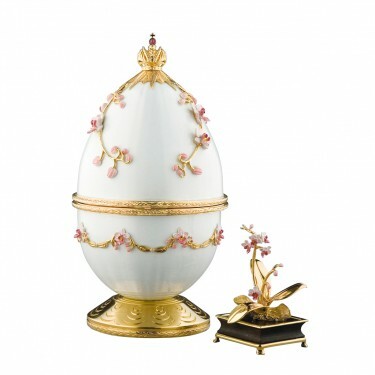 The surprise within is a classic jardiniére, hand-carved in ebony and holding an orchid in bud and in bloom; the jardiniére may be lifted out for display adjacent to the closed Egg, and bears the full hallmark. Further orchid sprays lie on the surrounding velvet floor, one set with a faceted white diamond. The PINK ORCHID EGG is the second in Theo's Flower series, the first being the Poppy Egg. The PINK ORCHID EGG pursues a family tradition of objets d'art, and its individual presentation assures the enhancement of every beautiful dwelling-place.